Cancun holidays transport you across the Atlantic to the Yucatan Peninsula on the east coast of Mexico. If you love sun, sand and sea, this is the place for you. With fine, white sand glinting in bright sun, clear, sparkling blue seas with tepid waters, first rate accommodation, scrumptious food and a lively nightlife, Cancun holidays have wide appeal. Great value holidays to Cancun. If you are seeking a tropical paradise, but don't want a desert island atmosphere, a cheap Cancun holiday may be just the ticket. It is also becoming a popular wedding venue and is a favourite honeymoon destination. A variety of accommodation is available but many visitors choose the all-inclusive option. Older children often appear to have insatiable appetites and unquenchable thirsts, so the all-inclusive complexes may be cheaper than you think. Cuisine is international with menus providing traditional Mexican food alongside offerings from around the world. 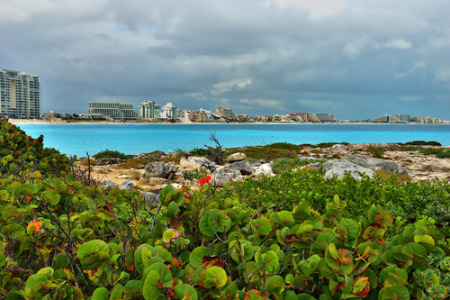 Cancun is a modern town that was built with holidaymakers in mind. It therefore has all modern amenities, with lots of activities to fill your days. Golfers have a choice of championship courses, and many choose the winter months to avoid the cold, damp days at home. Water sports abound and the Maya coral reef is a huge attraction for divers and snorkelers. It is a very fertile reef filled with marine life of all colours, shapes and sizes. If you should tire of the beach, you could take an awe-inspiring excursion to the fantastic Mayan ruins. Here you can visit the famous Pyramid of Kukulcan or the lost city of Chichen Itza. This exotic destination can be enjoyed at any time of year as the temperatures are always high. If you find humidity is a problem, avoid the months from May to September which is the rainy season. If you are interested in a cheap Cancun holiday, use our search facility and you won't be disappointed. As a price comparison site with almost three dozen companies vying for your booking, you can be sure we'll direct you to the holiday that offers you the bargain of the day. Your dream Cancun holiday is only a phone call away. SPRING BREAK! What Happens in Cancun? - If you're spending March or April in Cancun, you should probably get acquainted with Spring Break.